Welcome back to The Cookie Elf File! About once a week, The Elf will send you a favorite cookie recipe (complete with a list of ingredients and instructions) or fun baking tips for baking homemade cookies... the easy way. The Cookie Elf is on Pinterest! Join us on Pinterest! Browse our 60+ boards (and growing) for all kinds of cookie inspiration and practical information, like chocolate chip cookies, no bake cookies, cookie gift baskets -- even special treats like gluten-free cookies! Happy pinning! Coconut Macadamia Nut Cookies combine rich coconut-dark chocolate candy pieces with macadamia nuts and additional coconut producing an unusual, luscious tropical drop cookie. Drop cookies, as the name suggests, are baked by dropping or pushing spoonfuls of cookie dough onto the baking sheet. During baking, the mounds of dough flatten and spread. Drop cookie dough can range from very soft to quite stiff. Coconut Macadamia Nut Cookie dough is rich and thick. 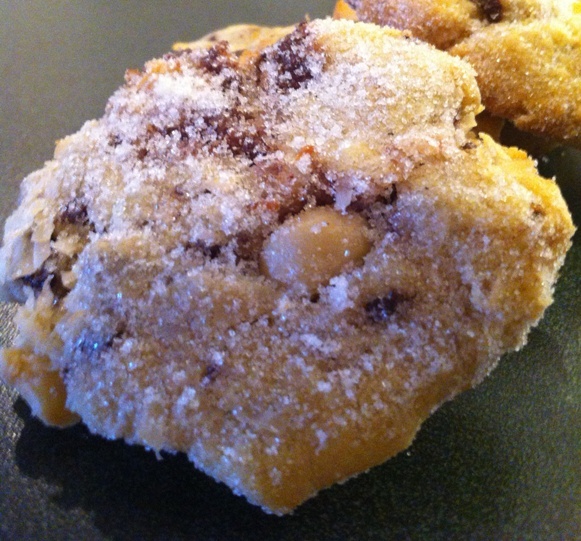 Get the full recipe for Coconut Macadamia Nut Cookies. Plus be sure to check out our Coconut Cookies Pinterest board for more cookie inspiration. That’s it for now. See you next time!